According to a report from Sport, it has been claimed that Marcelo has made it clear to Real Madrid that he wants to depart from the club at the end of the season. The Brazilian superstar feels that his time at the Santiago Bernabeu has eventually come to an end. Hence, in meetings with the club's hierarchy this week, the 30-year-old has made the top brass aware of his intention. Marcelo was visibly upset by Ronaldo's transfer to Juventus in the summer transfer window of 2018 and since then, reports linking him with a move to the Serie A club continue to float around. Real Madrid underwent a torrid form in the first half of the 2018/19 season, but have had a new lease of life since the winter transfer window. The developments at the Spanish club of late have also resulted in some managerial changes. Following Julen Lopetegui's embarrassing dismissal, Santiago Solari has taken over, whose reign has cut down on the playing time of quite a few star players. Under Solari, Marcelo has fallen down the pecking order with his berth usurped by Sergio Reguilon. As a result, this has compelled him to ponder over a change of scenery. Juventus will be the most probable destination for the Brazil international owing to the possibility of a reunion with his former teammate Cristiano Ronaldo, who has apparently urged the Old Lady to lure him to Allianz Stadium. If the present circumstances at Real Madrid are taken into account, the report makes sense. 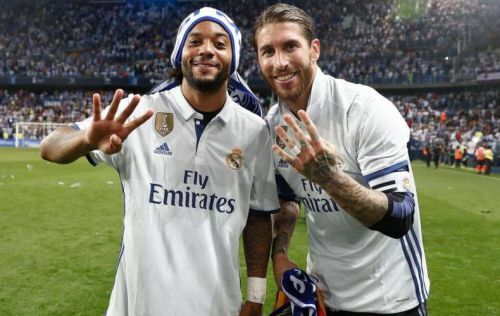 Since Ronaldo's departure, even Marcelo's own form has taken a nosedive and it is evident that he wants to reunite with his Portuguese friend. Real Madrid will be manifestly reluctant to lose their star player and will try their level best to stave off his exit.